Monday, Jan. 23th is Lunar New Years. Starting this weekend, there’s many events happening in Chinatown to celebrate and welcome the Year of the Dragon! Starting at the Museum of Chinese in America (MoCA)… There’s the Lunar New Year 2012: Decoding the Chinese Almanac with Joanna C. Lee and Ken Smith, co-authors of the Pocket Chinese Almanac, this Saturday, Jan. 21 from 2:30 p.m. to 3:00 p.m..
On Sunday, Jan. 22nd from 10:00 a.m. to 5:00 p.m., MoCA welcomes you and your family to Lunar New Year Festival Family Day where there will be workshops on traditional Chinese dance, calligraphy and language. MoCA is also hosting walking tours this weekend as well as next Saturday Jan. 28th. The tour takes visitors through Chinatown to experience the traditions and customs observed by Chinese households and businesses in preparation for the New Years. The schedule can be found here. Then on Monday, Jan. 23, there’s the Firecracker Ceremony from 11:00 a.m. to 3:30 p.m. at Roosevelt Park between Grand and Hester Streets. Firecrackers are ignited to bring good fortune and scare away the bad spirits. 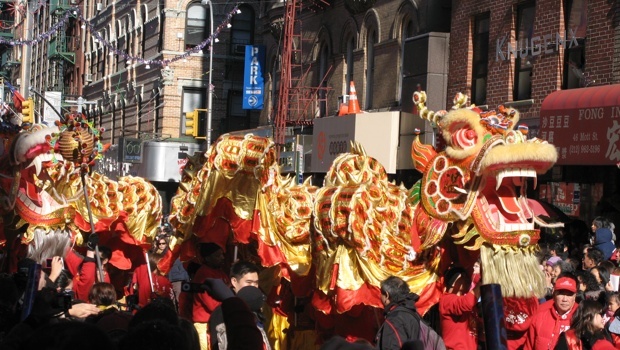 On Sunday, Jan. 29th, there’s the 13th Annual Chinatown Lunar New Year Parade and Festival. The parade starts at 11:30 a.m. around Canal Street South and weaves through the streets of Chinatown. There will be music, dragon dances, performances, and many decorative floats from local organizations and community groups. The streets will be crowded, but it’ll be great! Oh yeah, firecracker confetti shooters too! Those are always fun!